Every architect makes his or her living by designing for other people, but their talents shine brightest when they design for themselves. 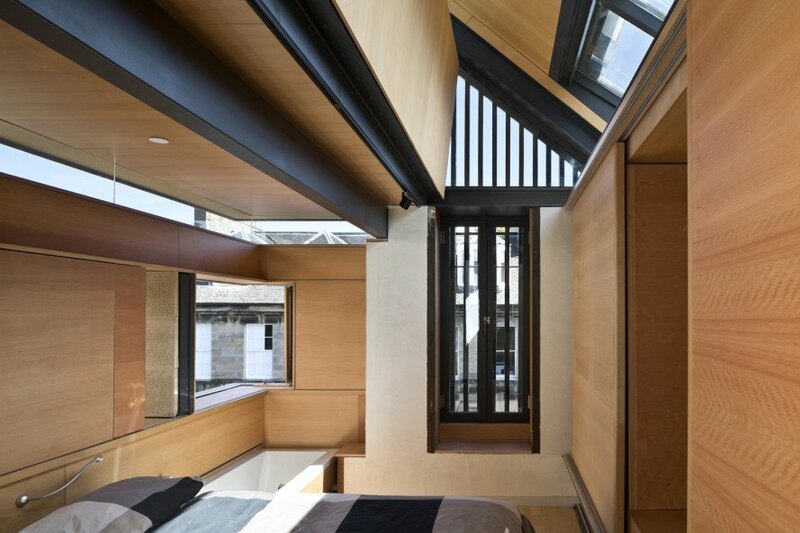 Architect Richard Murphy of Richard Murphy Architects played both client and architect for his self-designed Murphy House on Hart Street in the New Town of Edinburgh. The contemporary home is modest in size, but optimizes spatial arrangement and boasts a strong commitment to energy-efficient design with a solar rooftop array, rainwater harvesting, underfloor heating, and more. Located on a street corner and sandwiched between two estates, the Murphy House occupies a small plot of land, approximately the size of half a garden. Despite introducing what would seem like a disruptive modern design to a World Heritage Site, the compact building actually helps knit the architectural landscape together. The house serves as a bookend to hide an unsightly and abrupt gable end on the west side of Hart Street, while the home’s stone-clad facade continues the traditional stonework pattern of its neighbors. 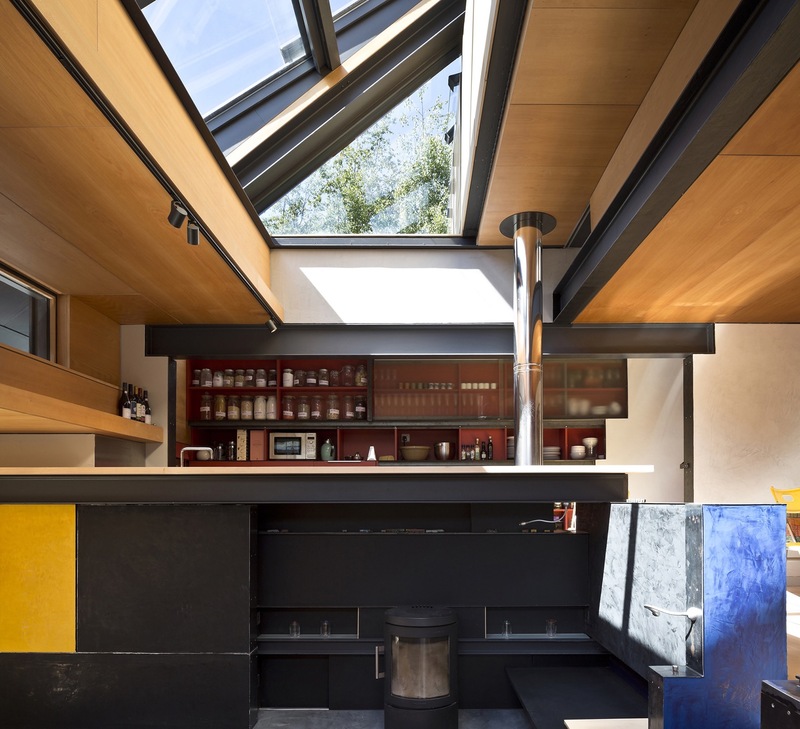 The interior of the 165-square-meter home comprises three bedrooms; a combined living room, dining area, and kitchen; study; basement storage; garage; utility room; and roof terrace. The dramatically sloped roof is topped with photovoltaic cells and skylights that let in natural light. The south-facing roof is also built with mechanized insulated shutters to minimize energy loss, while a computerized air circulation system transfers warm air from the apex of the home to the basement. Rainwater is harvested from the rooftop and reused to flush toilets and for irrigation. A geothermal system feeds underfloor heating and hot water is pre-heated using energy from the flue of a log-burning stove. 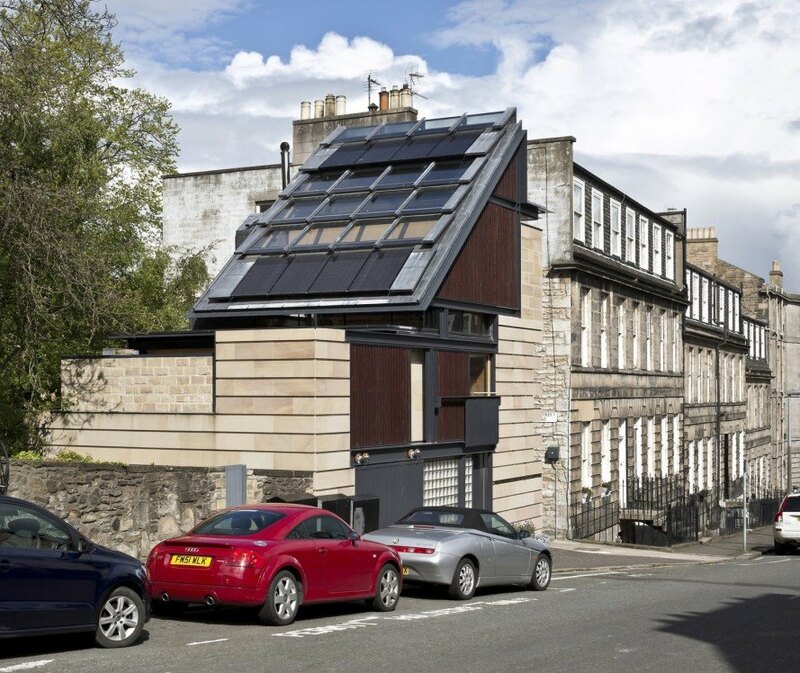 Inspired by Carlo Scarpa and Reitveld’s Schroder House, the Murphy House is remarkable not only for its customized details as an architect’s self-designed house, but also for its controversial contemporary appearance in the notoriously restrictive planning environment of Edinburgh’s New Town World Heritage Site. Located on a street corner and sandwiched between two estates, the Murphy House occupies a small plot of land, approximately the size of half a garden. Despite introducing what would seem like a disruptive modern design to a World Heritage Site, the compact building actually helps knit the architectural landscape together. The house serves as a bookend to hide an unsightly and abrupt gable end on the west side of Hart Street, while the home’s stone-clad facade continues the traditional stonework pattern of its neighbors. The interior of the 165-square-meter home comprises three bedrooms; a combined living room, dining area, and kitchen; study; basement storage; garage; utility room; and roof terrace. Rainwater is harvested from the rooftop and reused to flush toilets and for irrigation.